In place of a conference call with airlines, Boeing will next week hold a series of regional meetings to answer questions about the safety of the 737 MAX. And in a message to employees, CEO Muilenburg denied that a procedure to deal with a new flight control system is not covered in the pilot manual. 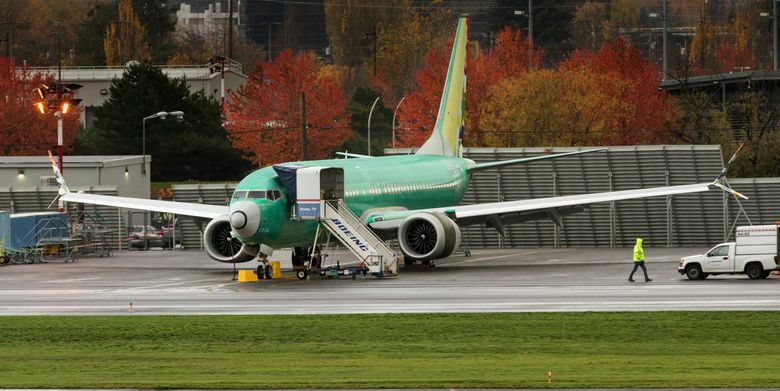 The planned meetings are intended to allow Boeing engineering and maintenance staff to answer technical questions from their airline counterparts. The original teleconference call was arranged in response to queries from airlines after the disclosure of a new automated flight-control system introduced on the MAX that may be implicated in the fatal Oct. 29 crash of Lion Air flight JT610. A Boeing spokesman said it proved difficult to find a time that worked for all participants around the world. Separately, Boeing is offering reassurance internally to employees. Boeing Chairman and Chief Executive Dennis Muilenburg sent an email to all employees Monday expressing confidence in the safety of the MAX and disputing some media reports. Muilenburg’s message begins by saying the loss of the Lion Air jet “is weighing heavily on our collective hearts and minds” and expressing sympathy with the families of the 189 people killed. He went on to emphasize the central importance of aviation safety to the company. He then tried to counter what he called “false assumptions” and speculation. More than 240 of the airplanes are flying passengers around the world today. Secondly, Muilenburg disputed specific reports in some media related to the MAX’s new automated flight-control system — called MCAS, for Maneuvering Characteristics Augmentation System. That system was introduced because the MAX’s new engines, which are larger, heavier and tilted more forward and higher on the wing, make the plane less stable in a potential stall situation than the previous 737 model. MCAS is designed to kick in without pilot action if a sensor on the fuselage indicates a high angle of attack, meaning the plane’s nose is too high and threatening a potential stall. In such extreme circumstances, MCAS will automatically swivel the horizontal tail in such a way as to push the nose downward and will repeatedly do so as long as the angle of attack measure remains high. The Indonesian National Transportation Safety Committee indicated that the Lion Air flight computer received false angle of attack data on the fatal flight, which may have led MCAS to repeatedly force the nose of the plane down uncommanded by the pilots, according to a service bulletin Boeing sent out to airlines soon after the Lion Air crash. The 737 pilot manuals don’t mention MCAS, and some pilot unions expressed concern last week that they were not made aware of it before the Lion Air crash. In particular, they said one handling difference with earlier 737 models should have been called out: that pulling back on the control yoke won’t stop the nose-down pitch movement. A message from Southwest Airlines to its pilots on Nov. 10 indicates that Boeing believed it unnecessary to describe MCAS to pilots because they wouldn’t encounter it in normal flying, while in an emergency approaching a stall it would simply kick in and help the plane recover. However, though the manual omits mention of MCAS, it does describe exactly how a pilot should deal with uncommanded and unwanted movements of the horizontal tail, whatever the cause may be. An emergency checklist describes a short procedure needed to cut off automated signals to the tail and stop the nose-down movements. So in Muilenburg’s message, he specifically denied reports in some media outlets that the procedure pilots need to deal with such uncommanded movements was not in the 737 pilot manual and that pilots were not trained on how to handle it. “That’s simply untrue,” Muilenburg said. Boeing Commercial Airplanes chief Kevin McAllister also reaffirmed in a video message to employees Monday that the jet maker is actively supporting the Lion Air crash investigation.